Some of the most intelligent and competent professionals still may lack the skills of connecting with audiences when they deliver presentations. Our Presentation Skills workshops teach you the most valuable skill a presenter can have: how to connect with your audience. If you can't make a connection with the members of your audience, your presentation is just reciting information - and that information, without a personal connection, is not likely to hit home. 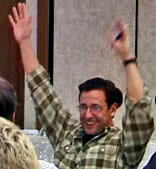 We teach our workshop participants how to be enthusiastic and dynamic, without hype or phoniness. The best presenters are sincere, natural and authentic. But they display an unmistakable passion for the subject matter they are speaking about. 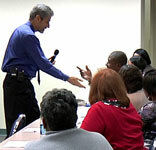 We will teach each member of your team how to become that kind of presenter. There is nothing more painful than sitting through a boring presentation. We teach workshop participants how to bring variety into their presentations, with humor, visual aids and audience participation. Audiences need to be engaged and involved; they need to enjoy the experience you bring them. We will teach your team members how to do more than just present. They will learn to create a fun and rewarding experience for their audiences. Ultimately, every presenter needs to understand that the purpose of a presentation is not about the speaker or the subject matter they are presenting. The presentation is about each member of the audience and his or her response to the presentation experience. Effective presentations influence their audiences - to see things differently; to change their mental models; to make decisions; to take action. Effective presentations affect an audience's thinking and emotions. We will teach your team members how to make every presentation about the audience; and in the process, we will dramatically improve the effectiveness of their presentations. Effective presentation skills are essential for anyone who delivers group presentations, runs group meetings, or is expected to present ideas in team planning sessions. Unfortunately, the vast majority of people who give presentations have never received formal presentation skills training. If the members of your team are lacking in presentation skills, you should consider scheduling a presentation skills training workshop for the team. Ineffective meetings and presentations are extremely expensive. If a meeting or presentation is productive, it's a good time investment; if not, it's an costly waste of time and resources. Your investment in presentation skills training for your team members will result in better meetings, better results and higher productivity. 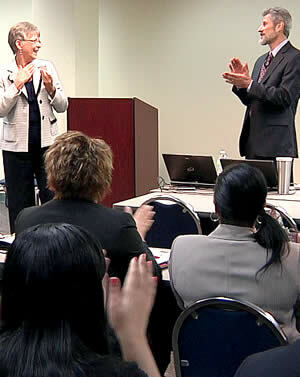 Your presentation skills training investment may be the best investment you can make for your team. If the group you manage is a sales team, your investment return is even higher. Don't waste any more of your organization's time and money on ineffective meetings and presentations. Your investment in presentation skills training for your team members will result in better meetings, better results and higher productivity. 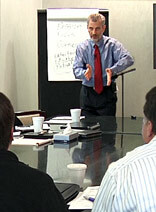 Your presentation skills training investment may be the best investment you can make in your team. 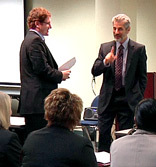 If you manage a sales team, presentation skills are even more critical for your team members. 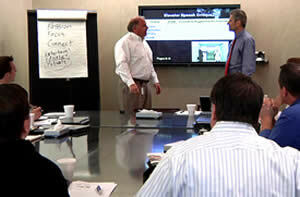 With your sales team, we will focus your presentation skills workshop on influencing buying decisions. If you are interested, we can combine presentation skills training with selling skills training, including consultative and relationship selling techniques. Please visit our sales training website at www.SalesTrainingSeminarsAndWorkshops.com for more information about how we can help you build a winning sales team. Every participant in your presentation skills training workshop will have the opportunity to practice presenting in front of the group. 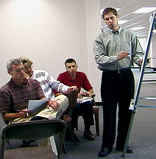 Our workshops are hands-on, and participants are called upon to give spontaneous three-minute presentations to practice specific presentation techniques. 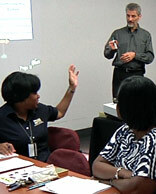 Participants receive immediate feedback after each presentation to pinpoint areas for improvement. We will also video the entire workshop, so participants will be able to review the training as well as their own presentation performance and critiques long after the workshop is over. Whether your team members are novices or seasoned presenters, we will design the right program to challenge them with the skills they need to improve their speaking skills. Prior to the workshop, Roger Reece will consult with you over the phone to gather information for customizing your workshop to meet the needs of your group. We can build a workshop to cover a half-day, a full day or two days in length, and we can hold your workshop at your facility or at an offsite location. 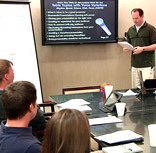 If you are planning a conference or retreat, we can integrate a presentation skills workshop into your agenda to provide a fun, valuable and energizing addition to your program. Contact us today for a free consultation with Roger Reece to find out how you can quickly improve the presentation skills of your group. Every day, your team members are reinforcing their poor presentation habits, and the results are diminishing the effectiveness of your organization. Give them the training, techniques and guidance they need to dramatically improve their presentation skills.